French 16th-century brown morocco tooled with the fleur-de-lis and various flowers, a panel of acorns on the spine; Instruments of the Passion at center front cover, Annunciation center back cover, in blue morocco case by Marguerite Duprez Lahey. Purchased by J. Pierpont Morgan (1837-1913), 1902. Said to have been made for, and inscription on 2nd flyleaf states book used by, Françoise d'Amboise, foundress of the community of Nazareth, ca. 1480; 18th century bookplate on 4th flyleaf with the motto: Dieu écrit droit sur la ligne courbe; sale by Sotheby's (London, Dec. 12, 1893, no. 70) to Pickering for Richard Bennett; Catalogue of manuscripts and early printed books from the libraries of William Morris, Richard Bennett, Bertram, fourth Earl of Ashburnham, and other sources, no. 77); purchased by J. Pierpont Morgan (1837-1913) with the Bennett Collection in 1902; J.P. Morgan (1867-1943). 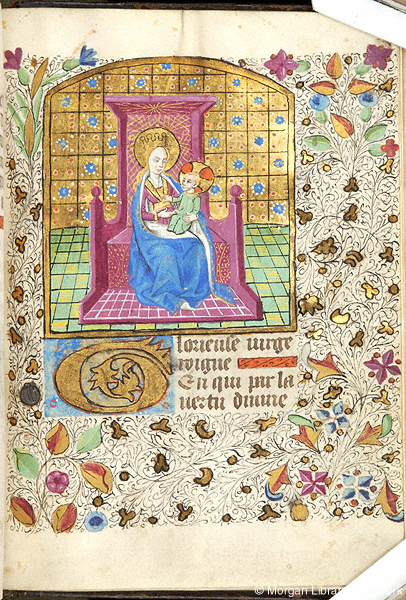 Ms. book of hours for the use of Rennes (Calendar and Hours of the Virgin); written and illuminated in Brittany, ca. 1465. Decoration: 31 large miniatures; French Gothic style.